Bedtime is just as fun as playtime when you have the Floppy Fox sleeping bag! 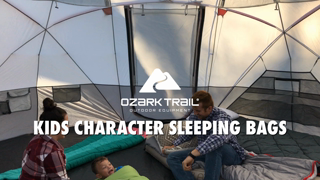 This colorful character is perfect for sleepovers, camping, naps, and playtime! The Floppy Fox sleeping bag has a soft, breathable liner that will keep your child cozy. But don’t worry about messes, because this sleeping bag is durable and machine washable. The Floppy Fox sleeping bag measures 24 inches wide by 62 inches long and comes with a dual 2-sided zipper with an easy pull cord. This sleeping bag is full of character! Shoulder Length to Feet: 41"
Perfect size for my 3 yr old (with room to grow) and for the clearance price of $9 (in store purchase), worth it. My daughter loves it! Its cute and comfotable for a toldder. I bought this sleeping bag last year for our annual family camping trip. Our two year old son at the time love it. Its bery comfortable and keeps him warm. Our son is three years old now and I know for next year we will have to purchase another slwwping bag. 6 and under, but very cute. Great up to age 6 I would say. The actual bag piece is only 38-40 inches long, or about to an average women's waist. Fairly cheap fabric but soft. It is the kind that tends to catch on very dry skin, but otherwise is soft. It is definitely cute. I got it on clearance for $7, for my 2 year old, so it was a great purchase for me. :) I will say it is hard to get back in its bag. If you fold it in half, it's too thick, so I kind of bunched it and rolled single, which worked ok. I read the reviews of this bag and the other animal shaped sleeping bags and found that the only complaint is that this bag is smaller than advertised. The dimensions given go from the tip of the fox's head all the way down to his feet, and the actual bag is smaller. That is exactly what i was looking for, as I have a tall two year old and wanted a preschooler sized sleeping bag. The dimensions of the bag are 39.5 inches from the top of the sleeping area to the bottom, and the opening at the top is 22 inches across, and the zippered portion at the bottom is 16 inches across. Other than the size misrepresentation, this is a great sleeping bag for young children.